Written Images is the brainchild of Martin Fuchs. For his diploma thesis, he put out a call for entries for people to create generative artwork. The stipulations were as follows: Each program should save four images to disk, each image taking less than 15 seconds to render, and then the program should self terminate. All of the printed pieces would then be assembled into a book. For my submission, I decided to create a project based on the phenomenon of Coronal Mass Ejection. The CME is a massive burst of solar wind, often resulting in the ejection of solar material. 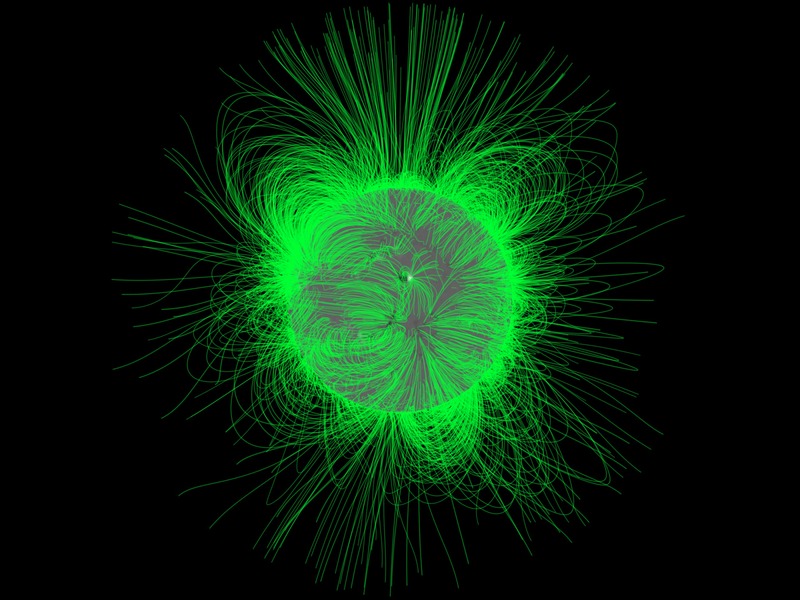 The image below, from NasaImages.org, depicts magnetic field lines emanating from the surface of the sun. I decided this would be my primary inspiration. For my CME simulation, I decided to start simply. First, I draw a Sphere in the center of the screen. This main Sphere has a far reaching but fairly weak negative charge. On the surface of the Sphere, I add a few dozen to a couple hundred smaller spheres. Each of these smaller spheres contains a much more confined but stronger positive charge. Because all the smaller spheres have the same polarity, they push each other apart. I let them drift on the surface of the larger Sphere for about 2 seconds. Once the 2 seconds are up, I lock the spheres into place and flood the simuation with a few hundred to a few thousand tiny particles. These particles are at the mercy of the magnetic field. They are immediately pushed away from the smaller spheres. As they move further away from the center, the positive charge from the smaller spheres becomes overwhelmed by the negative charge from the central Sphere and some of them are pulled back into the center. Early study, with spikes which I quickly abandoned. The final decision was based on each image taking up a full spread in the book. Since the image would be split down the middle with a seam, I decided I would render two spheres per image. However, the 15-seconds-per-image limit was still an issue. I was already at 15 seconds and the thought of bringing it down to 7.5 seconds per Sphere was not acceptable. After 7.5 seconds, the particles have barely had any time to spread out and none of them would be able to make the round trip out and back to the center in that short amount of time. So I decided to cheat. I would create the Sphere and when it was time to save out the print res version, I would show it from the front on the left half of the image, and then swing the camera around to the back and use that for the right half of the image. Two for the price of one!